Next, we have a new bow! You know how I love a bow. The Dark Blue [BL]/Earth Blue [TLG] roof at the rear of Parisian Restaurant seems to feature new 2X2 bows above and below the windows. Looks like there's one in Tan [BL]/Brick Yellow [TLG] as well, as this picture of the chair in the first-floor apartment suggests. It joins the same family of curves as part 11477 (the 1X2 'baby bow') and 61068/88930 which is the 4X2 version. Now for something quite special; a 2X2 inverted dome. Here Jamie has attached a flower stem to it, indicating there must be a single stud in the bottom of the 'bowl'. Flickr user Chris Malloy, present at the Seattle unveiling, snapped a couple of pics of this part and asked Jamie a pertinent question. Apparently both round and square 2X2 bricks will attach on top of this new part, I assume held by that large lip on the rim. I'm dying to see what a regular 2X2 dome looks like on top. It won't make a perfect sphere but should look very cool. Using this new part as a hanging basket is a great idea, and that isn't the only use Jamie found for it. Somewhat ironically he inverted the inverted dome, to make a lampshade. As you can just make out from these two angles, the inverted dome is attached upside down on an upside-down bottle, which in turn is attached to... wha...? Hang on a cotton-pickin' minute. That's a 2X2 round tile for the base, but the stud of the upside-down bottle attaches to it. That can surely mean only one thing? A 2X2 round tile with a hole in it. If Homer Simpson is in need of a large doughnut next year, I think we have the solution. This new, ahem, doughnut tile is really exciting. AFOLs love combining parts to create a '180° reversal'; either to make studs point in opposite directions or to make 'anti-studs' (the holes on the bottom of parts) point in opposite directions. This new part enables the latter - effectively, they've added an anti-stud to the top of a part. 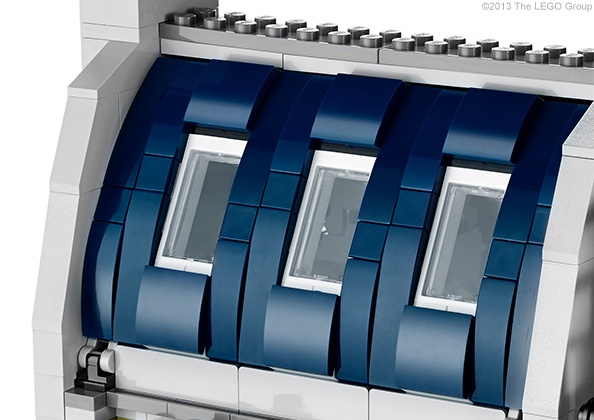 That's not new - for example Technic plates have holes, but the studs then get in the way of building. Offhand I can think of only one part that has a flat surface with a hole; the 2X2/2X2 bracket first released in 1979. Here I show it with an upside-down 2X2 jumper stuck into the hole; an incredibly useful 180° reversal but only if the vertical bracket doesn't get in the way of your build, which it does almost all the time! So imagine this with no bracket (and a round shape at the base instead) - that arrangement will be a nice stable basis for most builds, being 2X2, so long as you can cover up or utilise the disparity of round and square parts. As it happens, TLG have released an even more compact part that can be hijacked for 180° anti-stud reversals; the 'One Ring' element, 11010, from Lord of the Rings sets. It's effectively just a golden LEGO hole. This is great for small delicate builds, but I find the connection too unstable to base a larger robust model on. And those rings ain't cheap. Coincidentally, the One Ring comes in Parisian Restaurant - as a minifig is proposing, awwwww. 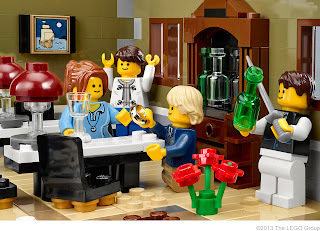 This is classic LEGO storytelling! I love how the waiter is performing sabrage - the Napoleonic tradition of whacking the entire end of the bottle neck off with a sword. I was shown how to do it once; it's the nuts. 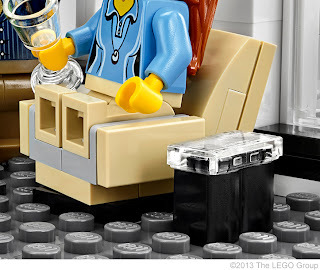 But don't try this at home, kids, not even with your LEGO. Polycarbonate scratches all too easily. Um, where was I? 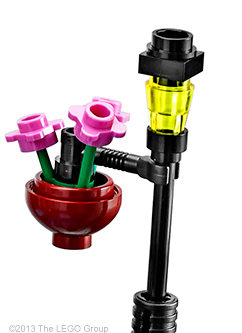 This is the first non-LotR set to feature 11010, indicating that this part isn't licensed so can be used in non-LotR theme sets. Not only are there new parts but also new elements - as in, existing parts in new colours. 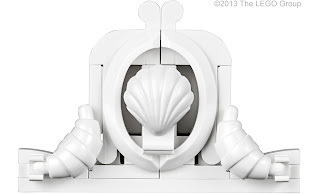 The white croissant is pretty cool and used for excellent architectural details, but the jaw-dropping inclusions are of course the array of Olive Green bricks; as Jamie points out in the promotional video, the set has bricks in 1X1, 1X2, 1X3, 1X4, 1X6 and 1X8! Of these, only 1X2 and 1X6 are currently available so this represents a massive leap forward for the colour. Ah Monsieur, with these new elements you are really spoiling us. A final observation - I see the new variant of the regular round 2X2 tile that I mentioned a few months back is being used in a way that takes advantage of the central anti-stud on its bottom. I guess that means this new version is being kept separate from the old in TLG factories after all - usually, parts from new moulds seem to get mixed in with the old ones. 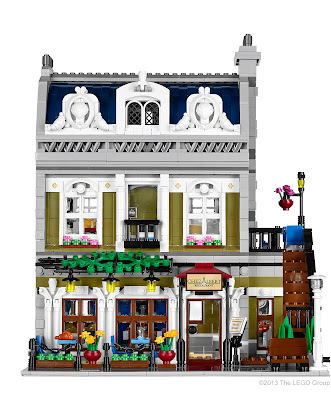 10243 Parisian Restaurant will be available in January 2014 and the prices will be US$159.99 | CA$189.99 | £132.99 | €149.99 | DKK1299.00. Thanks for the well written review, made me laugh, and what a lovely set. The disappointing thing about that picture Jimmy is that it seems to show the cooker details being a sticker rather than a printed tile. Are you referring to the round speedometer tile that has been used in tons of sets (like most of the TMNT line) over the past year? Yeah, I doubt very much that they're going to make a sticker to replace the printed version that they already have (though I admit, they have both printed and stickered 2x2 round tiles with Imperial logos listed on BL). 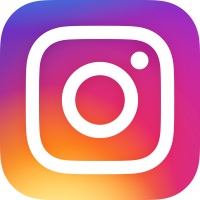 I think the bigger issue people will have with that is that it's clearly a speedometer deco, where the old 1x1 square tile with round gauge deco would have worked just as well and not put an odometer on a stove. Also, for future reference, if you click the Reply link directly beneath a primary reply, it will cause yours to stack beneath it as a common thread. Clicking the Reply link at the bottom of the list makes yours a primary response instead. I kinda prefer the Wordpress system, where every response has its own Reply link (meaning you can reply to a reply to a reply instead of just replying to the common thread), and where I can get e-mail notifications for every additional response that is added after I make mine. The One Ring does not give you a good 180° stud reversal. Studs are slightly taller than a plate height meaning you will achieve an extra unwanted gap. You may be able to hide it in larger builds somewhat. For that matter the new donut tile will give you the same effect. Stick a 2x2 jumper in each side though and see how flush your plates are. There'll be gaps, I guarantee. 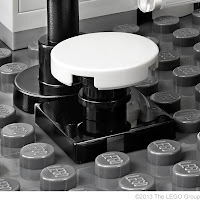 The advantage of the donut tile, though, is that you don't NEED a stud in both sides of the same hole. 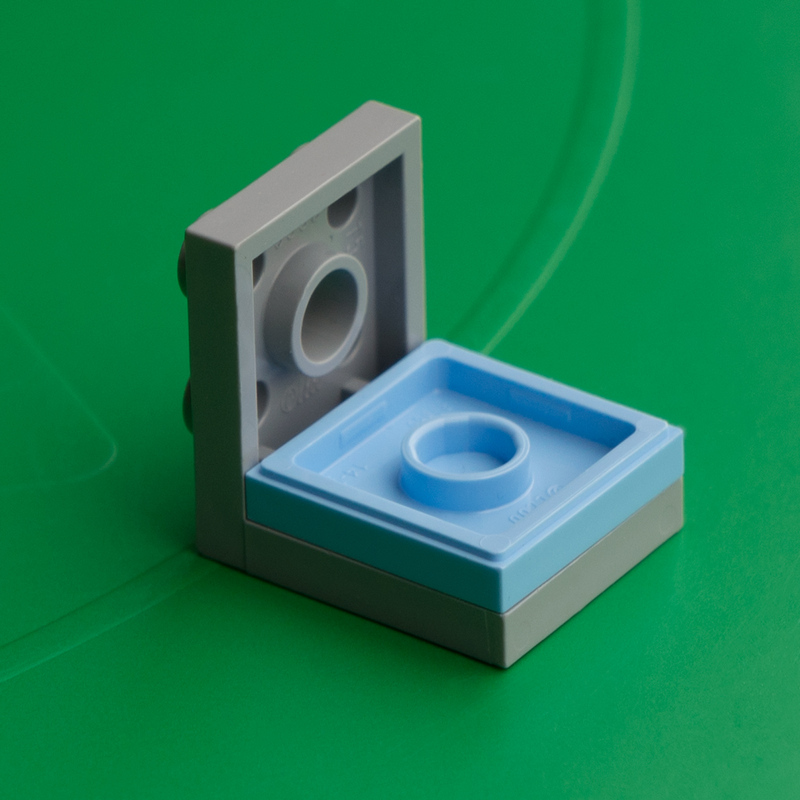 A donut tile plus a single 2x2 jumper plate is all you need to get a two plate thick object with four perfectly-aligned anti-studs on both sides. There's no need to add a second 2x2 jumper plate because the donut tile has four of its own anti-studs that can be used just as effectively. Understood but I'm giving the example as it is a better way to see how the thin SNOT technique does (or doesn't) perform well. You can also stud reverse two plates back to back with bucket handles. It's flush, but you need two or more for good clutch, so the plate size is obviously an issue. 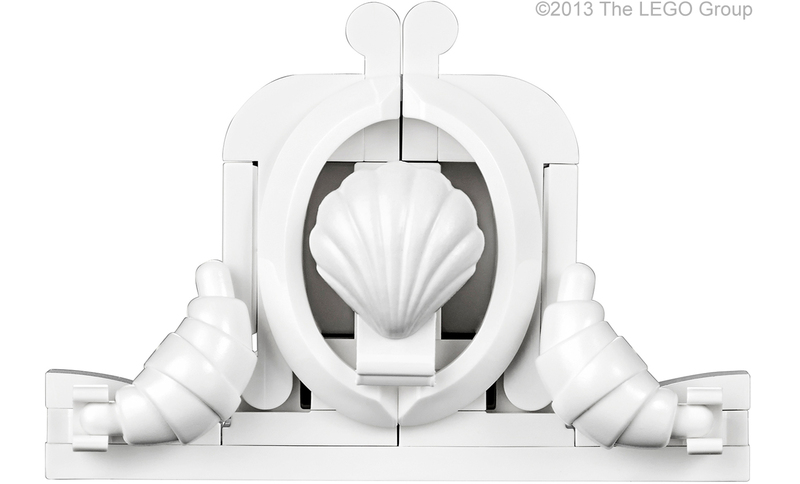 I think the doughnut tile will be a Mixels part. I came across listings in TLG's parts database for it in Bright Yellow and in Brick Yellow with an unknown decoration, so I believe we can rest assured that it will be showing up in several colors come next year. It also appears in black in set 70725 and in white in set 70724. Those sets, as well as 70723, have their own share of interesting new elements, such as a black "A-Frame" plate, used for Nindroid hang gliders in 70724 and 70725, on the wings of the Nindroid MechDragon in 70725, and on the sides of Jay's vehicle in 70723. The scooter looks like shades of the one that Brickforge partnered with Arclight(?) to produce. On the whole, the Brickforge one looks better, but the LEGO one has the advantage of a clip on the underside that could allow for more stability. Presently, the best option I've found for a BF scooter is to put a cheese wedge on a 2x2 radar dish and drop the front pocket of the rear wheel well on the high point of the cheese wedge. As for the lampshade, sadly, I guarantee there will be tons of people who pair that up with a solid white 2x2 dome and think they're very clever for doing so. For the 180 degree reversal, the jumper or the recent double-jumper can be paired with a handful of different wheels to produce a similar effect, but you have to go seven plates thick to stay within normal geometry. My Batman Elec-tron cycle is powered by four The One Rings, as that was the only way I could figure out how to build the wheel assemblies. Two things of note on this. One is that hollow studs give you a slightly sturdier connection, but _still_ leave a tiny tap. The other is that not being a licensed part has much more significant implications for LUG members coming up in a few months. Olive-green 1x1 bricks means I can take the olive-green 1x1 plates that I paid so much for out of my Shellraiser. I would only be happier if this was taking place a year ago so I didn't have to buy the plates in the first place. I can also put some 1x4 bricks to use, as I had to make do with 2 1x2 bricks end-to-end for the front door. For the 2x2 round tile, we'll certainly see if they're kept separate if someone ends up getting the old X-version in their copy of this set. Combine that with a 1x2 jumper plate for a 180 reversal. The idea that the old 2x2-2x2 bracket was the only such piece was bugging me, but I couldn't figure out why. Now I know. However, the keychain logo tile is imperfect in this use as well, due to the fact that you can't simply attach it to the center of another plate. The tap either has to hang over the edge, or rest on top of a 1x2 or larger tile. With the new donut tile/double-jumper combo, you can use it anywhere with no additional parts. All you need to have is a 2x2x2/3 pocket to put them in. Well, and tiles on the mating edges. On numerous occasions I have used the 1x2 finger hinges to achieve a 180 degree reversal at a height of only one plate by simply turning one of the hinge pieces upside-down. Sometimes more than one is needed to be sturdy, but it fits very well into tight places. Whoa! Thanks for the Heads up on the "Lego Hole" I didn't realize that. I'll have to check out Bricklink to see if I can find a few of the rings. The scooter also seems to be making an upcoming appearance in the Friends lineup in 41027 Mia's Lemonade Stand, in a color I don't know the name of, also includes what looks to be the 2x2 inverted dome in white. I don't recognize that green either. Looks sorta minty. 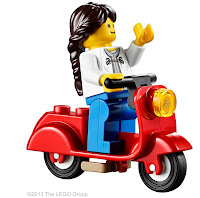 And now we see why the scooter does not have built-in handlebars, so they can use the same mold for both minifigs and Friends without forcing the Friends girls to steer with their wrists. I also see a magenta aviator helmet. And 1x1 round "cookie" tiles. The scooter looks to be Light Aqua [BL]/Aqua [TLG] to me. It's fairly new - 2011. Haha, thanks. 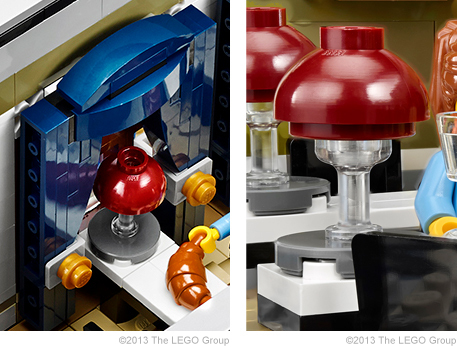 It felt slightly misleading in that he designed the set, not the parts, but was irresistible once hit upon!